DIRECT FROM MUNICH! This faithful reproduction of the famous Hofbrauhaus Munchen will not disappoint your craving for Bavarian food, beer, and entertainment. Hand-painted ceilings and communal dining tables will greet you in the beer hall. Fully costumed German musicians entertain and interact with guests, especially those visiting for a special occasion. The beers are all brewed in Munich. Dinner specials highlight an already ample menu full of wursts and schnitzels and strudels. Come early and start your evening with a freshly baked pretzel and a Hofbrau Original Lager, both imported from Munich. Hofbrauhaus Las Vegas, located on Paradise Road directly across the street from the Hard Rock Hotel, is the first faithful reproduction of the famous Hofbrauhaus Munchen, which was originally built in Munich in 1589. Entering the restaurant, you first find a gift shop and small bar in the entry area. The bar proudly serves Hofbrau brews and pretzels imported from Munich. Adjacent is the gift shop, which carries signature Hofbrauhaus clothing, hats, commemorative liter steins, traditional costume wear, six-packs of Hofbrau beers, and other gifts and souvenirs. When you are ready to dine, you will be greeted by a Bavarian costumed hostess who may just resemble the St. Pauli girl. You may choose to dine in the beer hall (Schwemme), or you may choose the more relaxed atmosphere of the beer garden (Biergarten). We chose the noisy but delightful beer hall. Entering the beer hall, which seats 380 guests, you are confronted with a sensory overload. The German band is cranking out the traditional favorites, inviting guests to get up and dance and join in the festivities. The hand painted high-vaulted ceilings and artwork are a Rococo mixture of classic and gothic feeling. Cherubs and mythological symbols are represented in a garish style highlighted by decorative moldings and German and American flags. Guests are seated at the same long communal tables as is the custom in Bavarian beer halls. The biergarten is located behind the beer hall. It is an indoor, climate-controlled patio, which is perfect for the harsh heat in the desert summer. Away from the band and the din of the guests and silverware clanking, the biergarten is a little more intimate and low-key, although this area seats 430 guests and is a great place for a large party. We were seated at a communal table with one other guest. Our waiter informed us that the firm BVTHBavaria L.P. is responsible for the creation of this reproduction. The opening of the restaurant brought local German chefs together to create a specialty menu. Our waiter went on to inform us that the special seasonal draft beer was “Maibock” with 7.2% alcohol content and the German Reisling was Dillman Peisporter Michelsberg QBA (California table wines are also available). Maibock is a spring brew first created in 1614 in response to a call for a new stronger beer. This is the oldest bock beer in Bavaria and it has a strong aromatic taste. We had a sample taste of the Maibock but chose instead a liter of the Hofbrau Original Lager, which along with the Hofbrau Hefe Weizen (wheat beer) and Hofbrau Dunkel (dark beer), is brewed in Munich under the country’s 400 year purity law and shipped fresh. Although we were served the beer chilled, as is common in the United States (rather than room temperature as in Germany), we still experienced that true flavor of authentic German lager. Not long after our first sample of the brew, the German band amped up the festivities by chanting “Prost” in true German beer hall style. The crowd seemed to know their cue and everyone seated at the communal style tables raised their liters and joined in for the toast. As the band continued with their set, which was from 5:00 p.m.until around 11:00 p.m. guests felt comfortable enough to sing and get up and dance in the aisles. The beer hall is truly a party atmosphere so intimate dinners or business meetings may be a bit of a challenge. We began our Bavarian dining experience with the Bavarian Liver Mousse and Obazter (Cheese Specialty) which were served with vegetables and a freshly baked pretzel. We especially enjoyed the creamy, liverwurst-style mousse, but could have used more than one modest-sized pretzel for the amount of mousse served. Pretzels were for sale separately on the menu or, during happy hour from 5 PM -10 PM, from a waitress walking around with a basket of the jumbo imported pretzels. Obazter consists of Brie prepared with cream cheese, butter, and onions, which was mildly seasoned and slightly slippery in texture. Both flavors were complemented by the modestly salty pretzel and combined nearly perfectly with the bitter lager. We also sampled the Creamy Bavarian Potato Soup, which is always a soup of the day, served with fresh vegetables and sliced sausage. The soup is hearty enough to serve as a main course for a lighter appetite. Out of the many Bavarian specialties on the menu, I chose the Hofbrauhaus Wurstplatte which headed up the sausage specialties. It consisted of Vienna style frankfurters and pork and chicken sausages, all which had about the same lightly seasoned salty flavor that blended well with the smooth, nearly creamy caraway flavor of the accompanying sauerkraut. Mashed potatoes were served alongside, topped with a dark beer sauce that was rich with a slight sweet flavor of molasses. The dish was served with an onion mustard that was subtly spicy and tangy, complementing the salty sausages. My dining companion tried the Oktoberfest Braten Teller, which is a Bavarian pork and beef dish. One side of the plate held a pork roast “Hunter Style”, which had been slow cooked with onion, wine, and garlic, was melt-in-your-mouth tender and infused with rich flavor. On the other side sat a marinated pot roast, or sauerbraten, which was classically flavored with red wine and served with spatzle, a typical German-style pasta, and vegetables. The dish was served with a sweet, cinnamon spiced red cabbage ample enough to share. As we sampled each other’s delicious Bavarian treats, the band called for another toast. The beer hall was instantly on its feet. As it turned out there were several birthdays and a wedding party present. The band accommodated the wedding party with their rendition of the Chicken Dance as people all over the beer hall got up and joined in the dancing. As the crowd settled down after the communal chicken dance, we asked our waiter about the dessert menu. Although the special of the day was Tres Leches Cake, which is a vanilla layer cake soaked in three milks and served with custard sauce, whipped cream and marinated strawberries, we opted for the famous “Apfelstrudel.” Apple Strudel is a traditional dish from the countries that once belonged to the Austro-Hungarian Empire (Austria, Croatia, Hungary, Czech Republic, Slovakia, and Slovenia). Served with a vanilla sauce and optional ala mode, the portion was big enough for two considering the hearty foods we already consumed. The strudel was served traditionally warm and consisting of paper thin layers of pastry stuffed full of apples with raisins, walnuts, pine nuts, and almonds for a full range of flavors. The mild vanilla sauce tempered the tartness of the apples with a gentle touch. Hofbrauhaus is also a great place for a liter and a snack. Order some of the imported Bavarian sweet mustard or a spicy homemade onion mustard to go with the pretzel or better yet, get a Hofbrauhaus Brotzeitteller, a platter of pork roast, black forest smoked ham, sliced sausage, cheese, pickled gherkin, onion mustard, rye bred and butter to share with your friends. The wait staff is helpful and fully able to answer questions about the dishes (if they can hear you over the polkas) and the beers. A child’s menu is available and children who can be tolerant in a very active environment will be amused by the silly grown ups dancing and chanting. You should be prepared to participate in the festivities as this is the most interactive crowd I have found in Las Vegas. You will undoubtedly leave Hofbrauhaus with a full belly and a smile on your face. Main Dining Room | All Day 11 a.m. - 11 p.m.
Main Dining Room | All Day 11 a.m. - 11:45 p.m.
Can I make a reservation for a party of 10? Yes, though Hofbräuhaus asks for 48 hours notice for reservations for parties of 10 or larger. Do you have a dress code and do we have to make reservations for just 2 people? The dress code is business casual. No beach attire or athletic attire allowed. Reservations are suggested. With fresh vegetables and sliced sausage. Served with raw vegetables and a freshly baked pretzel. Served with butter and rye bread. Great with HB Beer and highly recommended! Munich's famous sausage salad marinated in vinegar and oil with onions and sliced swiss cheese. Served with rye bread and butter. A Bavarian Cheese Specialty you will love! Brie prepared with cream cheese, butter, onions, delicately seasoned and served with a freshly baked pretzel! Great Starter and Fun to eat! But first the radish needs plenty of salt so he can cry! Bavarian white and red radishes with buttered rye bread and chives. Cold cut platter with pork roast, black forest smoked ham, sliced sausage, cheese, pickled gherkin, onion mustard, rye bread and butter. Sliced ham, swiss cheese, and Bavarian sausage with fresh salads of the season, tomatoes, cucumbers and peppers. Crisp Lettuce, Shredded Cheese, tossed in a Caesar dressing, topped with our Famous Pretzel Croutons Add a Grilled Chicken Breast for 4.95 or Grilled Salmon for 7.95. Fresh Salads of the Season Tomatoes, Cucumbers and Peppers Add Grilled Chicken Breast for 4.95 or Grilled Salmon for 7.95. Breaded Bratwurst Patty, fried golden brown, served with Spinach-Potato Salad in warm Bacon Vinaigrette. Very tasty and fun to eat! Giant Pork Sausage with Sauerkraut on French Bread, served with Onion Mustard. Breaded Chicken Breast Fried Golden Brown Served on a Kaiser Roll. For Sausage Lovers! Hofbrauhaus Sausage Plate with Vienna Style Franfurters, Pork and Chicken Sausages, Imported Sauerkraut, Mashed Potatoes and Onion Mustard. From the Bavarian Sausage Heaven! Two of Munich's famous white Sausages (Veal and Pork) traditionally Poached or Grilled with freshly baked original Pretzel and Sweet Mustard imported from Munich. Sausage at its Best! Three roasted Pork Sausages with Sauerkraut and Mashed Potatoes. Four Vienna Style Frankfurters with homemade Bavarian Potato Salad and Onion Mustard. This is one of Bavaria's absolute Favorites! Bavarian grilled Sausage Loaf served with Potato Salad. 100% veal. Two delicately seasoned Veal Sausages grilled to perfection. Served with our famous Hofbrauhaus Red Cabbage and mashed potatoes. Hofbrauhaus roasted Chicken Sausages served with Sauerkraut, Mashed Potatoes and Onion Mustard. Classic Breaded Pork Cutlet served crisp and Golden Brown, so large that you might not find your plate. With Cranberries and homemade Bavarian Potato Salad. This is one a Bavarian cannot live without! 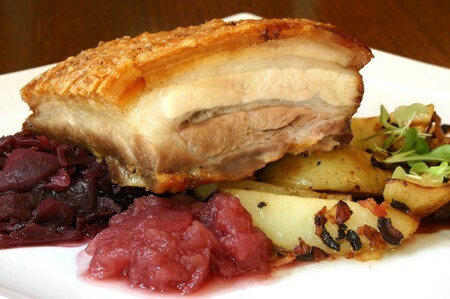 Famous "Munich Pork Roast" with Vegetable Garnish, Dark Beer Sauce, Potato and Bread Dumpling. A Great Combination of Bavarian Favorites, for the Big Appetite! "Hofbrauhaus Platter" with Smoked Pork Loin, Pork Roast, smoked Sausage, Dark Beer Sauce, Sauerkraut and Mashed Potatoes. Oktoberfest Style Roasted Half Chicken stuffed with Parsley, Beer Butter and Onions served crispy brown with homemade Bavarian Potato Salad. Pork Cutlet "Hunter Style" topped with creamy Mushroom Sauce, Bacon, Onions, served with Spatzle (a special german Noodle) and Cranberries. This is probably the most popular German Dish! Marinated Pot Roast "Bavarian Style" with Red Wine, Vegetable Strips, Potato Dumpling and Red Cabbage. Bavarian Pork and Beef Specialty with Pork Roast "Hunter Style" and Spatzle, Marinated Pot Roast (Sauerbraten) with Vegetables and our famous Red Cabbage. Enjoyed by Beer Truckers after a hard day! Delicately seasoned 10 oz. Rib Eye grilled to Perfection, served with Roasted Onions and Mashed Potatoes. Marinated Pork Cutlet on Toasted Rye Bread with Onion-Beer Gravy and Seasoned Wedge Potatoes. Grilled 10 oz. Rib Eye topped with creamy green Pepper-Brandy Sauce, served with Seasoned Wedge Potatoes. From the Bavarian Dairy Country! A very Special German Noodle with Swiss Cheese, crisp Onions, and Hofbrauhaus Side Salad. This is the way Bavarians love fish! Golden Brown Filet of Ocean Cod with tasty Tartar Sauce, lemon and homemade potato salad. The most famous Dessert that you must try! Traditional homemade Bavarian Apple Strudel with Vanilla Sauce. A la mode add $2.00. Bavarian Cheese Cake with Raspberry Sauce. Vanilla Ice Cream with Hot Raspberries, Cold and Hot You will love this exciting and refreshing combination! Famous Black Forest Chocolate Cake. We dined at this restaurant for lunch in June 2009 and it was absolutely fantastic! You have to try the cucumber salad. It was the best that I've ever enjoyed. The sauerkraut has an excellent flavor and texture, as does the red cabbage. I strongly encourage you to try dining here. The atmosphere, food, and service are truly wonderful.